settled in to her new Berth and looking forward to a good season and no lock gates to rush back for. 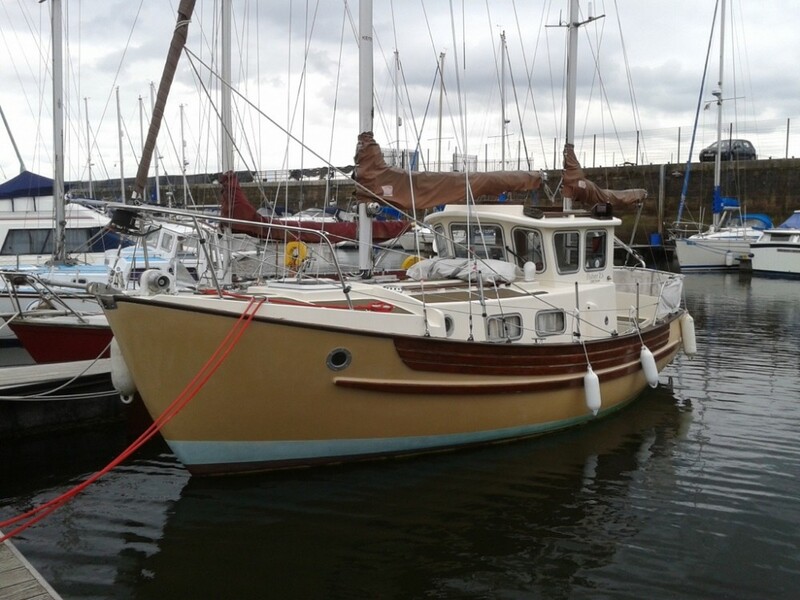 Hi Sean, sorry to hear you are still under the White stuff….we have had a mild’ish winter which has helped get the boat ready in time for move to Scotland. Aye the heater is in the port locker on the inboard side and I have built a shelf over the heater to the hull…..this protects the heater and provides easier access to mooring ropes , cushions etc. The heater is an Eberspacher D1, a 1 kw old version but still works well. We have two oulets…one in the wheelhouse and the other in main cabin. the exhaust as you spotted is on the port vent cheek which works ok. If the heater was to expire and I could afford I,t I would fit a 2 KW Webasto Airtop heater and extend the duct thru the heads into the forward cabin. Adding good insulation to the heater duct pipe makes a massive difference to the heat output. Good luck with your launch and a good sailing season.